Just glance down the page and be startled by all the famous people who say you will double your income, get out of debt, clean your messes, do more of what you love. Really famous people say this book is exactly what you need right NOW. Pretty much everyone who comes to this page just requests their FREE BOOK Download. If you’re like nearly everyone else, that’s what you’ll do too. After all, the book alone retails for $24. The title pretty much says it all: you’ll discover how to double your income while doing what you love. How to Clean up EVERY “Mess” In Your Life! Finally deal with all those little “open mental loops” that hold you back. Whether it’s a “big mess” like a relationship or financial issue… or a “small mess” like a cluttered closet or dirty dishes in the sink… my system cleans up those messes once and for all! And the best part is, it’s NOT about “discipline” or “doing more”… you’re going to be amazed at how well this works! How to KNOW for CERTAIN what it is you LOVE MOST. Not everyone KNOWS what they love, or what they would love to do. I will dispel the fog and show you with crystal clarity how you will ALWAYS know! How to do ONLY what you LOVE, all the time. I know this may sound almost impossible, and I would agree with you… except that this is the life that I live and that thousands of my students live. So I KNOW for sure it’s possible and that it works every time. I think you might like to know, too. 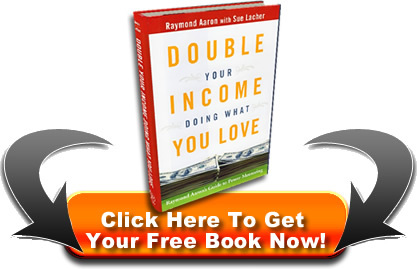 Why doing what you LOVE will DOUBLE your INCOME. Right now maybe you’re thinking you don’t want to “get your hopes up”. Could this really be true? What if this weird guy on the Internet actually knows what he’s talking about? If you’re thinking anything like that, it may be a signal from your subconscious mind telling you… check this out and get your free book. See for yourself. Read this book, and take control of your life. Using his MTO™ system, you can always have some level of success, and often it is the Outrageous success of your dreams! I was personally so impressed with this system that I have implemented it in my own office. My staff at Chicken Soup for the Soul Enterprises and Self - Esteem Seminars now use it, and each month we all set our goals using Raymond's unique goal - setting forms. Plus, using his own innovative techniques developed over the last two decades, he shows you how to—step-by-step—take conscious control of your world so you can double, triple, even quadruple your income doing what you love to do. Raymond has spent many years developing, refining, and testing the techniques that he teaches so you don’t have to struggle to get what you want in life. You don’t have to reinvent the wheel. You just have to follow his guidance. He is absolutely committed to helping you achieve what you want in this lifetime—just as he has helped hundreds of thousands of others around the world achieve their dreams. Raymond credits his success to the collected wisdom he has received from his mentors and his own life-tested techniques. Techniques that can help you create the most joyful, abundant life you can imagine. Techniques, incidentally, that he himself applies everyday. Most of us have heard that people who write their goals are most successful than those who do not. 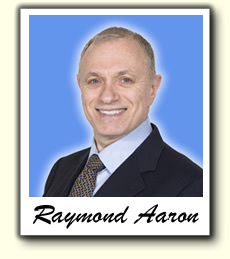 There is a teacher named Raymond Aaron who teaches subjects such as sales, goal setting and doubling your income. While these are subject taught by many people, I recommend his work simply because he has some fascinating insights into these important issues. Insights that can help you achieve more of what you want. I thank Raymond Aaron and his teachings on goal-setting for helping me achieve more with less stress. Raymond is the Master at teaching you how to achieve your own goals, especially by ensuring that you are powerfully invoking The Law of Attraction. Raymond's groundbreaking technology of goal-setting and goal-attainment is the first truly new material on this subject in many years. It is a unique approach that will skyrocket your ability to achieve your own goals. Raymond Aaron has spent his life discovering the secrets of how to create whatever you want in life. Raymond, unlike many authors, actually is a real-life expert and example of what he writes. If you follow his easy-to-use roadmap, you literally cannot fail. This book is for anyone who wants to take the reins of life and create prosperity, happiness and inner peace. Raymond has a remarkable ability to take the often-taught subject of goals and make it refreshing and brand new. His processes truly work. His volumes of success stories from loyal clients around the world are the best testament to the brilliance of his process. Raymond's goal attainment techniques are revolutionary. No one teaches the powerful processes he has developed. They really work! 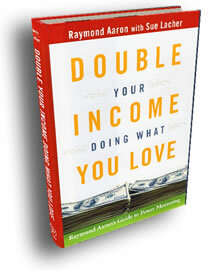 Digital copy of Double Your Income Doing What You Love by Raymond Aaron.